It’s snack time and my back hurts a lot. I just toasted my pimiento sandwich and prepared a hot coffee. Anyway, this morning I copied my newly bought CDs to my office computer. I started listening to Lea Salonga’s Inspired album, but my officemates started complaining that my music is starting to make them sleepy. I then played the CD of Christian Bautista. At first, they still have the same comment, but after the second song they started singing. Haha. 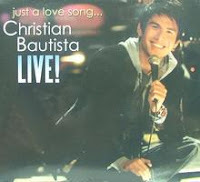 I really like this new album of Christian Bautista. No wonder it is number one on Philippine album charts. It has a wide selection of love songs we used to love.